The need for a new Lutheran congregation in Montgomery Township was discussed by synod officials as early as 1957 when the congregational council of St. Peter Lutheran Church, North Wales, asked the synod to study the possibilities. Due to lack of funds, a mission developer was not called to serve in the area until February of 1964. The Reverend Charles R. Steinhauer began his duties April 1, 1964. In June 1964 an "interest" meeting was held at the Lansdale YMCA. The future congregations first Planning Committee met June 4th that year and its first task was finding and securing a worship location. The first worship service was held August 2, 1964 in the basement of a sample house at the corner of Line street and Bridle Path Road in the Fairwood Farms development. Sunday School and Choir were organized in September of that year and the average worship attendance during the first six months was 41. The eight-month-old mission organized on Palm Sunday, April 11, 1965 with 60 charter members and 35 children. Steinhauer was officially called as pastor in June, and in August the present site at Cowpath Road and Morgan Street was purchased. Congregational members made alterations to the house located on the property and the congregation "moved in" in October 1965. In 1967 plans were formulated for a building program and ground was broken in February of 1968. By 1970 baptized membership was 203. The Reverand Donald C. Hagey was installed March 5, 1972 and the congregation began using the new Lutheran Book of Worship in 1979. By January 1980 the congregation was 250 members. The Reverend Charles F. Knappenberger was installed as pastor on May 6, 1984. In 1988 the house in which the Sunday School and offices were located was razed and the addition of a new Center for Christian Education was dedicated June 9, 1989. The Reverend Joyce E. Nelson was installed as pastor on June 30, 1991 and continues to serve the congregation which has grown to 290 members, with two worship services each Sunday. Three additional classrooms were added in 2001. 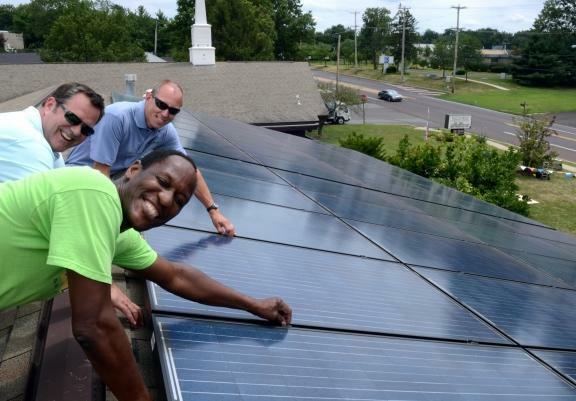 In December 2010 the church decided it was time to "Go Green" by installing Solar Panels to the roof of the lower building. In July and August of 2011 the installation took place and now we have 2 system and 12,000 watt solar panel system. Faith celebrated its 50th Anniversary in March 2015! In October 2018, The Reverend Joyce E. Nelson retired after over 27 years of faithful service to the congregation. Joining as Faith's interim pastor is the Reverend Ghislaine Cotnoir.